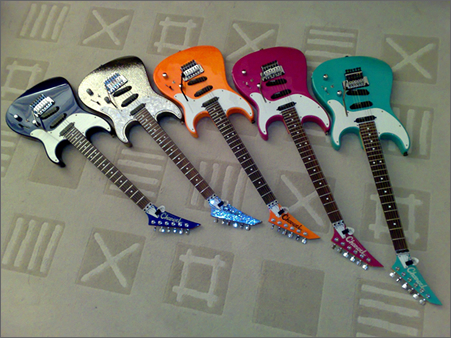 The Charvel Spectrum was a Superstrat type guitar made from 1989 to 1991 in a variety of wild colours. The series was inspired by a custom model made for Jeff Beck. The model was a part of Charvelâ€™s Contemporary Series, and was possibly named after the veritable rainbow of bright colours it came in – including bright orange, dark blue, teal and magenta. For the uninitiated, Superstrat guitars are so named because they take Fenderâ€™s classic Stratocaster design and update it, deepening the cutaways, putting in high-output pickups, often adding a Floyd Rose tremolo or one of its derivatives, usually having 24 frets as opposed to the 21 or 22 employed by the Fender. More expensive Superstrats often have neck-through construction and seven-string versions are not uncommon. This design of guitar is still made by Charvel, adding to the numerous models made by Ibanez, Jackson, BC Rich, ESP and Washburn. The whole genre of guitar was popularized by Eddie Van Halen with his famous â€œFrankenstratâ€ guitar. The Spectrum differed to the usual Superstrat template in various ways, having 22 frets, occasionally a maple fretboard, and a scratchplate based on the old Fender Precision Bass design. They also employed bolt-on construction as opposed to the neck-thru designs of more expensive Charvels. Many sources I have seen state that the body wood is poplar, although there isnâ€™t much concrete info on this. The neck is maple and the fretboard usually rosewood, although some versions have maple fretboards. The three pickups appear to be single-coils, but are in fact â€œstackedâ€ single-coil sized humbuckers with an active tone circuit with a wah function. I have been fortunate to play a couple of examples of this very nice guitar, and I think that any fan of the Superstrat design would like the Spectrum. They are quite collectable now, as not many were made and there are a wide variety of different and unusual finishes. They donâ€™t tend to command prices out of reach of most players, however. Man I had one of these for years. It was the desert crackle finish. I parted with it a few years ago in a thinning of the heard moment. I do miss it. It was a really well made guitar. This article brought all the good memories back. Thanks. I have a Spectrum in Seafoam green and it is in VERY GOOD condition. I am the original owner and have only played it a handful of times. It is currently going through a restring and full tuneup at the local shop and then unfortunately, I will be posting it on ebay. I wish I didn’t have to sell it. Even though I don’t play anymore it will be VERY hard to part with it. This was one of my absolute favorite guitars! I loved these when they came out, and last year got myself a seafoam green one from eBay. It’s in almost perfect condition, and it almost plays itself, I love it! I have a Electric guitar named Charvel. send us some pics then Jonny Boy! I’ve just bid one on e-bay yesterday, well at least from the pictures it looked to be in a very good condition, the seller claims that he bought it for his wife some 20 years ago and she quickly lost interest, the instrument has been barely played thus in a very good condition. I’ll probably receive it before next week-end, can’t wait. The reason why I bought this instrument is because I own a Charvel from the same period of time and same japanese manufacturer, the Classic series 375-Deluxe. Thus I appreciate very much the craftsmanship behind these extremely well build instruments, I’ve bought it new 20 years ago and still looks close to new for a guitar that’s 20 years old. For those who live in UK and intersted in collecting guitars, have also a look on the german e-bay, there are some interesting guitars to bid on. Oh by the way, the one I’ve bid on was the orange coloured Spectrum model. Does anyone know if Jeff Beck ever even played this guitar. I can’t find one picture of him with it? The Charvel Spectrum follows on from the rare Charvel Model 8, which looks identical except for the earlier US Charvel headstock logo (see second last pic), whereas Spectrums all have the â€˜toothpasteâ€™ logo. Jeff beck played a custom Jackson around the time of which acted as the prototype for the Model 8 and subsequently the Spectrum (the last pic shows him with it on the cover of a contemporary magazine. The video for â€˜Ambitiousâ€™ featuring the Model 8 is at http://www.youtube.com/watch?v=zbpQf22c494). Hi, for anyone that is interested. I have an Orange Charvel Spectrum listed on eBay UK right now, plenty of pics and could be one of your only chances to get hold of this beauty (check for username daverodders, but to be honest if you search for Charvel Spectrum you will only find my listing). All of them build between 1989 and 1991. Designed by Itaru Kanno today designing and building guitars for Caparison. Just about to list one in Sea foam green, with a maple neck in very good condition. Comes with the 1990-91 JHS retail catalogue which it is in. I also made enquiries when I first purchased it, for any available info on the Spectrum from the UK distributor. She sent me photo copies of various catalogues and more importantly the circuit diagram. A chance to own this gem of a guitar. Good luck! I have a desert crackle in mint condition, never play it, jus collecting. looking for an origional Kramer Beretta 85 or 86 all matching parts and numbers, and in perfect shape. May consider trade. Real Beretta! no reissues by musicyo or knockoffs please. I have a 1989 charvel flouro. The black wire from the pickup in the guts came disattached somehow. I have no idea where it is supposed to attach. if anyone can take a picture showing me where it attaches, I will be greatly appreciative.